Artist Colours/Pigments/Hues Used by Greek/Roman Painters in Classical Antiquity of Ancient Greece, Rome. common forms of painted art. The few paintings which survive from Classical Antiquity make it difficult to believe that fine art painting was traditionally the highest form of Ancient Greek art and greatly admired in Roman art. For surfaces, Greek painters used walls, ceilings, panels of wood or marble, ceramic slabs or terracotta plaques, and occasionally pieces of ivory, leather, parchment or linen. Of these, wooden panels, underpainted with white, were the most usual for important as well as minor works. From the 7th-century BCE, the available range of colours for both panel paintings and frescos was adequately wide, except for work on terracotta where paint had to undergo firing in the kiln. For murals, the painting methods were tempera and fresco; on wood and marble, encaustic and tempera - a method where colours were mixed with wax, painted onto the surface and then 'burnt in' with a hot rod. Encaustic paint was more permanent than tempera, albeit harder work, and displayed some of the rich tone of oil painting. For more about visual art during Classical Antiquity, see: Greek Painting: Classical Period and Greek Painting: Hellenistic Era. (475 BCE) Fresco on the north wall. hues, see: Colour Mixing Tips. For several reasons, not least the greatly increased demand for coloured robes and textiles, as well as more extensive trading arrangements, the colour palette used by Greek and Roman painters had expanded somewhat from Egyptian art. It now included: a range of reds, purple, blue, yellow, green, brown, white and black. Furthermore, colour-makers in both Ancient Greece and Ancient Rome succeeded in increasing the range of artificial hues from mineral sources and from biological dyestuffs. Hues used by Stone Age painters. Hues used in Ancient Egypt. As usual, iron oxide pigments (eg. ochres) made up the basic palette. Ever since the earlier Minoan civilization on Crete, where fresco was developed, fresco painters mixed their pigments with water and applied them to a fresh lime surface. The technique, known as "buon fresco", required pigments that stick permanently to lime. 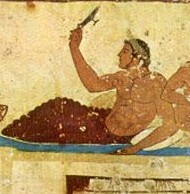 Iron oxide pigments, which were unaffected by alkalies, remained the basic palette of fresco painters throughout Antiquity. To them were added a range of lead-based colours like red, yellow and white - the latter was the most important version of white produced until the introduction of Titanium White in the early 20th century. Yellow red was obtained from the naturally occurring arsenic compound Realgar. For bright red, artists used a material known as "Dragons Blood". Described by Roman historians as the blood collected after the fighting of dragons and elephants, this was a common colourant until the modern era. It came from a gum resin obtained from a tree in South East Asia. But the most highly prized red pigment of the time, ten times more expensive than red ochre, was Vermilion. Known to the Romans as Minium, this orange-red hue was produced from a mineral ore called Cinnabar (Mercuric Sulfide) and appeared in the Mediterranean area about 1500 BCE. Probably mined in central or southern Europe, it was later superceded (8th century CE) by a much superior version from China. For purples and similar hues, Greek and Roman colour palette featured pigments like Indigo, obtained from the Indigofera plant family, and Madder from Madder plants. Woad (from the dyerswoad herb) might also have been used. Although principally employed as textile dyes, by Classical Antiquity these ink-type colourants had been developed for use in painting, especially glazing. The most popular of the purples was Tyrian purple, a hue produced from shell fish by the Phoenicians and made famous as the colour worn by Roman Caesars. It was also used by artists in Antiquity as a glazing pigment. Tyrian purple was available in tones of violet, true purple, and a very deep crimson. However, use was limited by its huge production costs. For their blue palette, Classical painters relied on the same pigments as the Egyptians: notably Azurite and Egyptian Blue. Azurite was a greenish blue pigment whose name stemmed from the Persian word "lazhward" meaning "blue". It was chemically related to the green pigment malachite. Egyptian Blue (Frit) was a dark blue pigment used throughout antiquity for use on a range of mediums such as stone, wood, plaster, papyrus, and canvas. It was later superceded in the 6th century CE by Ultramarine, the most fabulous blue in the history of art. An inferior version of Ultramarine (Lazuline Blue) was actually in use in both Greece and Rome, but it wasn't until the 500s that the Persians developed the key process for the conversion of Lapis Lazuli into Ultramarine. Among the green pigments used in Classical times were Verdigris, a synthetic copper green, (the name means "green of Greece"); green earth, a natural colourant of varying hue known in other eras as Terre Verte, Stone Green, Verdetta, and Celadonite; Egyptian Green, a sister of Egyptian Blue (see below); and the bright green Malachite, also known as Mineral Green or Verdeazzuro. For their yellows, Greek and Roman painters used Massicot and Naples Yellow, as well as the traditional Orpiment. Massicot came from lead oxide, while Naples Yellow - a warm yellow pigment - derived from Lead Antimoniate and appeared at the same time as Vermilion. 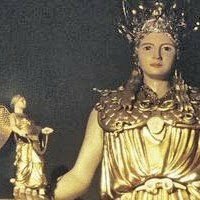 Naples Yellow (also called Giallorino) was reportedly obtained from Mount Vesuvius above the Bay of Naples. Orpiment was a rich lemon hue known to colour-makers since 3100 BCE. As a rule, brown hues were obtained from burnt and raw forms of clay pigments such as Sienna and Umber. In its raw state, Sienna, which contains iron and manganese, resembles a yellow-brown ochre: roasted or burnt it turns it a reddish brown. Similarly, Umber, a clay pigment used since Paleolithic times, is naturally a dark yellowish brown. Roasted or burnt Umber is coloured dark brown. These two pigments were the most stable colours on the Classical painter's palette. A major addition to the Classical colour palette was Lead White. Very fast drying, with the warmest masstone of all the white colourants and a heavy consistency, it remained one of the key white pigments until the 19th century. Other white colourants used included Gypsum, and Chalk. For their black hues, Greco-Roman painters relied on Lamp Black and Carbon Black (charcoal) and a new Ivory Black, obtained from burning bones or ivory.  For information about oils, see: Oil Painting: History, Painters.  For a guide to watercolours, see: Watercolour Painting.  For information about acrylics, see: Acrylic Painting.  For information about colour pigments and painting, see: Homepage.